Or something far more eloquent than that. 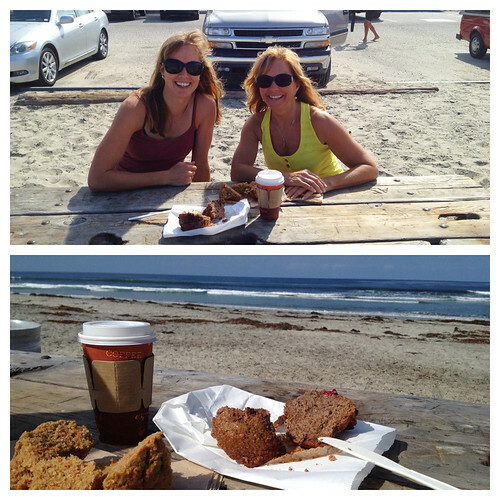 Muffins and a beach walk with my dear mom. I don’t have everything I want (mini freezer! rice cooker!) but I knew what he meant. I’ve by no means arrived—do we ever, and do we want to?—but these days I’m feeling the rhythm of daily life in a way I haven’t in a while. Maybe it’s that I’m immersed in my work in that way I vaguely crave when it’s absent. Maybe it’s these longer days. Somehow, things feel smooth. Not perfect, and not always good, but smooth. Before the 12,000 feet of climbing in 95 degree head madness. Training wise, I’ve been enjoying my non-structured rhythm. I keep meaning to “get serious,” and then later realize that working out on a whim brings me a lot of joy. After my last race, I took a training hiatus to enjoy my Mom’s visit (hello yoga and easy rides), and then worked back into things during a work trip to Texas. Last week I managed to log 18 hours of training, even with my new “joyful” approach. Sure, it sometimes causes me stress as I decide the night before what I’m going to do, but more often than not I’m enjoying the “what shall we do today, body?” approach. This training on a whim has taken many different forms. 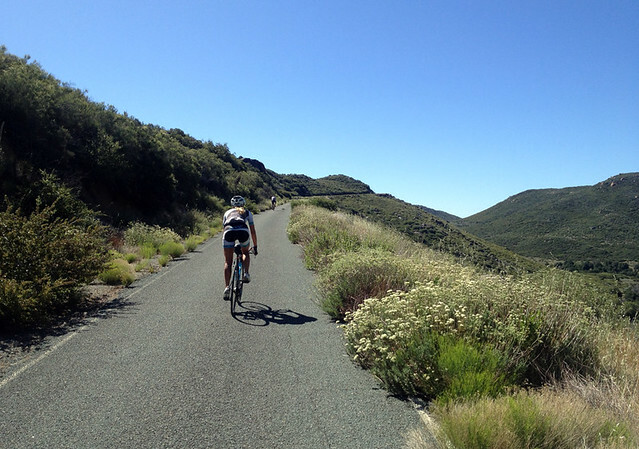 Like the hellish 104-mile pre Tour of California stage ride (above) that I only survived because of a very chipper blonde friend. Julian pie, and a new toy to try out (foreground). 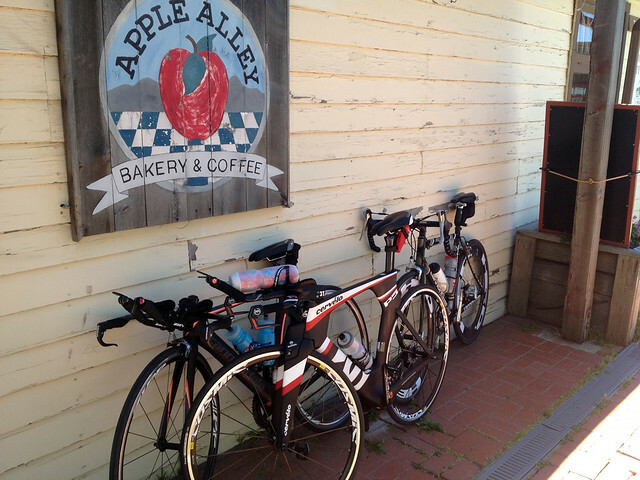 Like last Saturday’s breathtaking East County ride, featuring a mid-ride pie stop in the charming town of Julian. When life gives you back-to-back flats, make apple pie with cinnamon ice cream. Or buy it. 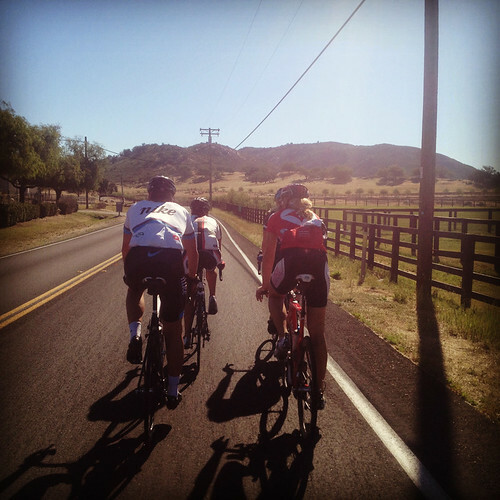 Like Sunday’s cove swim followed by a faster-than-comfortable run with one of my favorite training partners, and a Memorial Day coffee ride with a newly-minted Ironman. 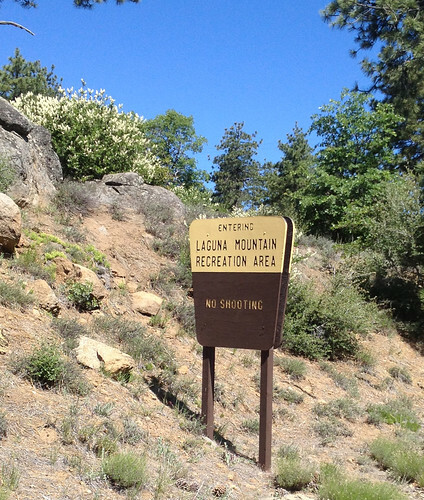 Like mid-week solo hill repeats, getting sunburned at impromptu Masters swim sessions at new outdoor pools, and dancing in the balance between pushing myself on my own and relying on others. Coming home from Ironman Texas. 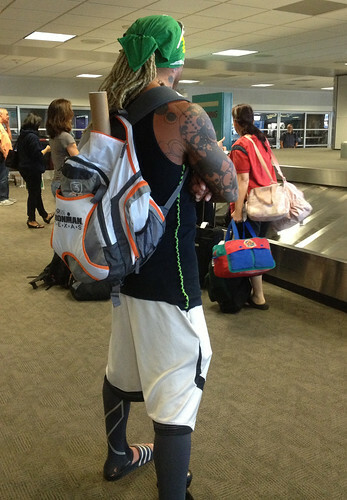 Dreads, tattoos, and compression socks. 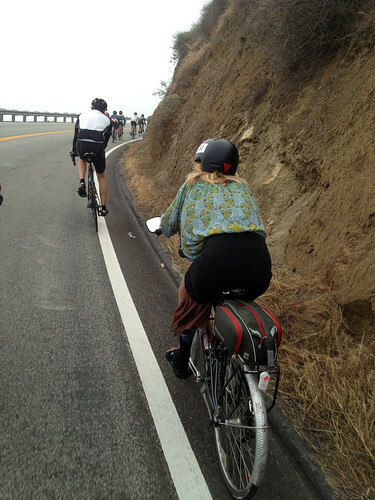 Spotted on the stage ride: Paisley, heart on helmet, butterfly socks.